I had the opportunity to travel to India in November 2011 – it was essentially a business trip, but the people I met went out of their way to show off their country, and I also had a weekend spent mainly in Agra – the site of the Taj Mahal. The Taj Mahal was every bit as awesome as the photos suggests, and I wrote this on the way from Agra to Jaipur. It seems fitting to start describing this place when in the car, which was in many ways my window to the this fascinating place. Travelling through the the streets of Agra you see it all – poverty, industry, smiles, purpose, friendships openly expressed, happy people, including the man with no legs begging in between traffic lanes at a toll-booth. Earlier, the rickshaw driver with two teeth, scrawny, dirty but not smelly, powering my 90 kg frame up a hill on the way to the Taj Mahal with his little legs whilst talking to me incessantly in easily understood English with no prepositions. The dirt, the filth, the seemingly derelict houses, refuse everywhere, rivers full of plastic bags floating on top of the oily surface, smelling of sulfur, topped off by the foul looking yellow foam along the edges. And of course the sacred cows, that protected relic of India, oblivious to its surroundings, glistening with fat from God knows what, many scavenging for food, no grass to be seen, guessing they must be fed by their minders, somehow, somewhere. Then there are the ever present stray dogs, so genetically bastardized over time that they all look the same, going about their business unheeded by their two-legged brethren. Goats, camels, donkeys, horses, geckos; just stopped for a big fat pig crossing the road. But no cats, reckon they know better, and almost no birds to be heard or seen. 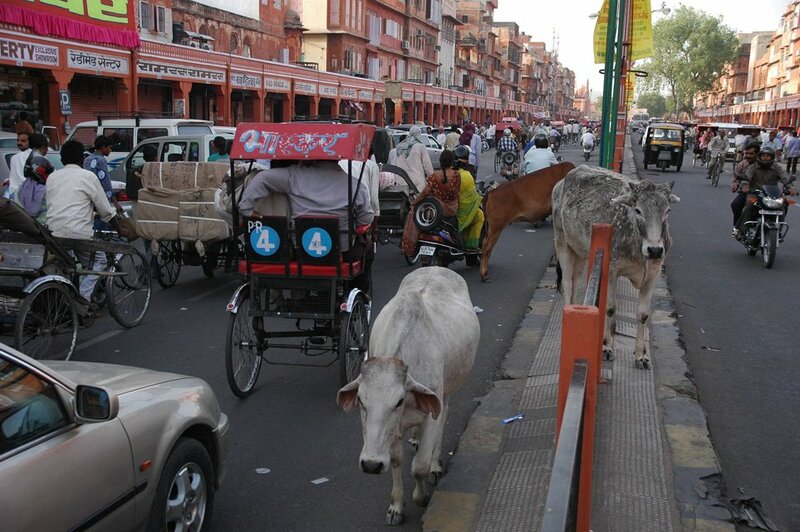 A week doesn’t give you much time to see India, but the over riding impression is that of an endless urban sprawl of people, with pockets of rural areas, so different from the opposite that we are used to, us Australwegians, where cities take up a fraction of our open spaces. The driving is an experience in itself, and I hasten to add I was a passenger, driving here requires a death wish that I do not posses! Driving in many ways also epitomizes how people here seem to appreciate life – she’ll be right, mate! At first I thought my driver was mad as we made our way from Dehli airport where I first arrived. Then I realised that he just conformed to the same rule as everybody else on the road – that there are no rules. First come, first through is the prevailing method of negotiating traffic as everyone darts in and out of spaces that I could swear didn’t exist. Cars, trucks, buses, scooters, push bikes, motor bikes, the ubiquitous tuk-tuk, tractors and the occasional Jugaad- more on that phenomenon later. The amazing thing is that it works, if there ever were more unflappable drivers than the ones (overwhelmingly male) in control of their vehicles I’d like to see it. Tootin’ their horns, never giving away any quarter or courtesies to others, yet no road-rage or one-fingered salutes. Want to do a short-cut up the wrong side of the road, sure; Wrong way around the roundabout, why not? Push in to jump the queue at a toll booth, give it a go, but be prepared to fight for every inch of space. Literally. My first three days I stayed in Noida, a suburb of Dehli and part of the NCR – National Capital Region – home to some 80 million people. My hotel was 5-star quality by our standard, at a cost less than half of what you’d pay for motel in Sydney or Melbourne. From my top floor window I looked down on ramshackle housing and not much else to see in the perennial fog of the winter season in Northern India. Turn left out the front door and a gated estate of houses for the well-to-do right next to the squalor of the street dwellers who live under makeshift pieces of plastic, canvas, or for the fortunate ones, a real tarpaulin. They sustain themselves off whatever they can find on that continuous garbage tip that we call road gutters. But despite the “in your face” prevalence of extreme poverty there is also a sense both of an upwardly mobile society and a culture of acceptance of life as it is. The rampant exposure to western consumerism is a strong indication of the former, and maybe Buddha has a lot to do with the latter? On that note, yet another example of the dichotomy that is India is the plethora of billboards that give colour to the urban gray of roads and buildings. In among the countless Satchin Tendulkar adorned billboards and the Bollywood glitz are all the global brands spruiking their wares to what will soon be the second largest economy in the world, not just the second most populous country (and even that will change in a decade or two). And if you are Finnish, and worried about the demise of Nokia, don’t, there is a Nokia store on almost every street and everyone who has a phone has a Nokia. And I mean everyone. It also underlines the impression of a practical approach to life, no better typified by the Jugaad. The Jugaad is the quintessential solution when you can’t afford a car. You take whatever parts you can find and put them together with scant regard for design, safety or any notion of a roadworthy certificate. All you need is a chassis, four wheels (preferably), an engine of sorts and a steering wheel. Seats are good, but a couple of wooden planks will do , too. 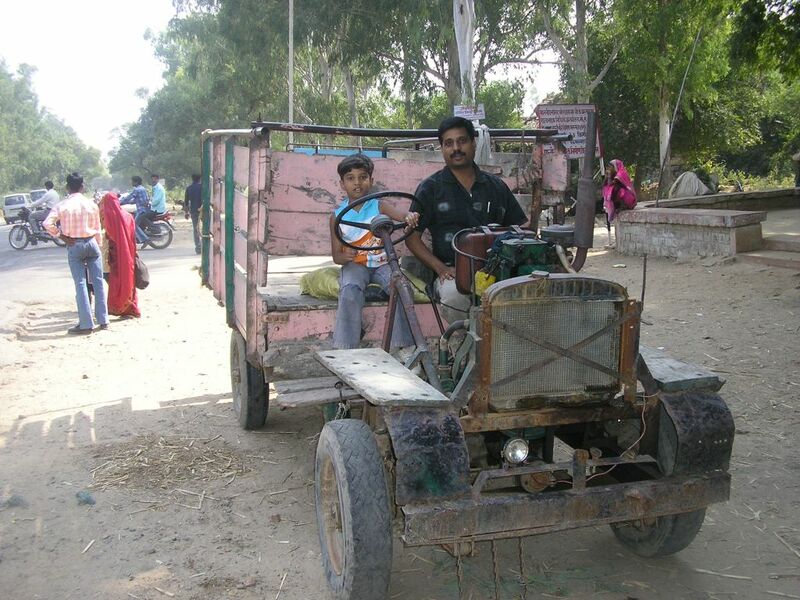 The “traditional” Jugaad is powered by a diesel engine originally designed for irrigation pumps. No better way to express the old adage that necessity is the mother of invention. Food is necessary, too, of course and I always enjoy sampling local food wherever I travel (including sheep’s balls in Iceland, but that’s another story). My Indian hosts both in Dehli and in Jaipur went out of their way to impress me with culinary delights at various restaurants, all cheap, all vegetarians, all delicious, all plentiful, and I quickly came to realise that our local “Bombay Palace” is a poor and limited representation of the variety of real Indian food. I never knew there were so many versions of Naan breads! Finally, and back to where I started, Agra. 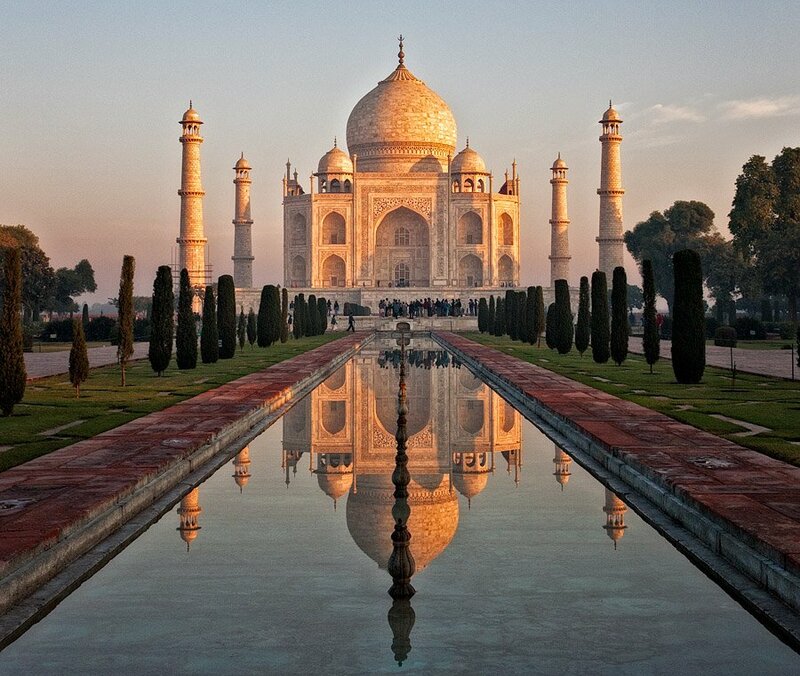 Dirty, polluted, noisy, and home of the most astonishing man made sight I have ever seen – the Taj Mahal. We have all seen the photos, we have heard others describing it, maybe even seen video or film clips, but no image prepares you for the real thing. It is truly breath-taking in all its splendour. Built in the 17th century as a shrine of remembrance to a queen who died during child-birth, it is as visually stunning as it is a symbol of utter waste by its owner, the grieving Shah Jahan who allegedly cut off the hands of the architect and the builders so they could never replicate his illusion of grandeur anywhere else. And that’s India for me, an illusion of reality that hits your senses at every turn. I’ll be back.